The Tunturi C65 elliptical offers 121 pre-set programs which is more than any other elliptical on the market. But it isn’t the overkill of programming that sets this crosstrainer apart from the pack: it’s the poor quality electronics and the overall lack of value. 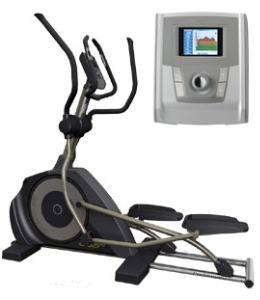 The Tunturi C65 elliptical has a 5.7" full color graphics display for readouts. The trainer boasts of offering 121 programs including manual, constant watts, constant HRC User defined, T-Scale, T-Ride, T-Trainer, Fitness Test, and Race. The display can be viewed in 8 languages. UPDATE: Tunturi ellipticals are hard to find. If you want to see their latest lineup here is a link to the official site. Tunturi has very poor accuracy in their readouts for heart rate and calorie consumption which is the first strike against them. That also means that the Ergometer, a calculation of personal energy used (in Kcal, power, and Watts) will also be off, and possibly the T-Pulse program which adjusts intensity according to your HR reading. One nice feature, on the other hand, is the T-Ride selection which graphically displays environments in full color to simulate outdoor training. Reviews on the Tunturi C65 elliptical are rare and hard to find since it is not a big seller in the U.S. Tunturi’s market is in Europe and the company hasn’t made any impact on North American fitness consumers, at least not with ellipticals and treadmills. What consumer comments there are have mentioned a few negatives such as the short 19" stride length, poor ergonomics, lack of adjustability, very noisy ride, questionable reliability, and high price. Additionally, reviewers note that it takes about six weeks to get a replacement part from the Finland-based Tunturi company. The Tunturi C65 is greatly overpriced at $2,299. If you can afford to spend $2,300 on an elliptical – it’s a candy store out there! — there are so many quality crosstrainers to choose from. Why go with a Tunturi when, for the same money or less, you can have an elliptical made by Life Fitness, Yowza, or even a reconditioned commercial Precor or Star Trac? All of them offer a history of reliability, longer stride lengths, fluid ergonomic engineering, accurate readouts, and better customer service. Skip the Tunturi C65 elliptical and go with a proven winner.